Lindenia Orchid Prints. Iconographie des Orchidees. Jean Linden Iconic Orchid Hunter! Lindenia… HORIZONTALS… Anne Hall Antique Prints is pleased to offer Lindenia Orchid Prints, Antique Lithographs, by Jean Linden and published in Belgium circa 1885. Hand finished color lithographs that are absolutely gorgeous! Each color seen was applied with a separate key stoned limestone plate called a lithograph. They lithographs were printed in colors. Each color used it’s own lithograph. This was a very laborious antique printing method. Then the chromolithograph was finished generally with water coloring, gum Arabic, or egg white (albumen). Each old print measures about 10 1/2 high x 13 1/2 wide. 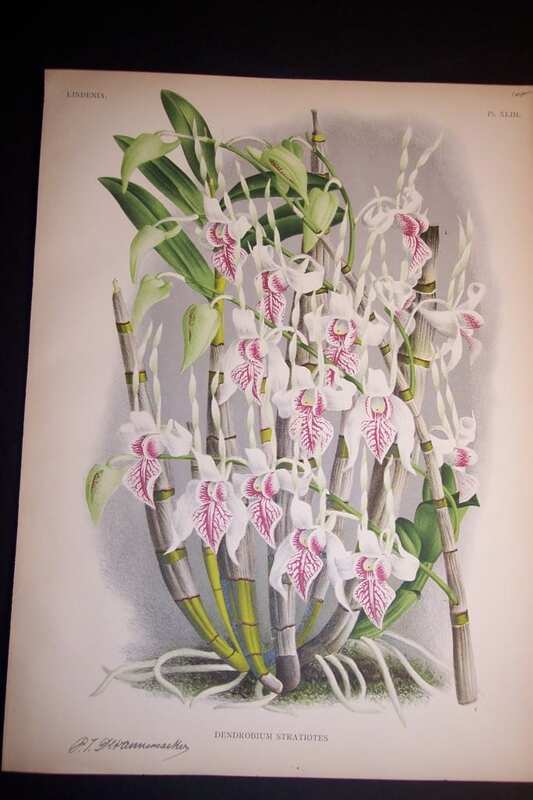 Lindenia Saccolabium Orchid Lithograph 710 $65. 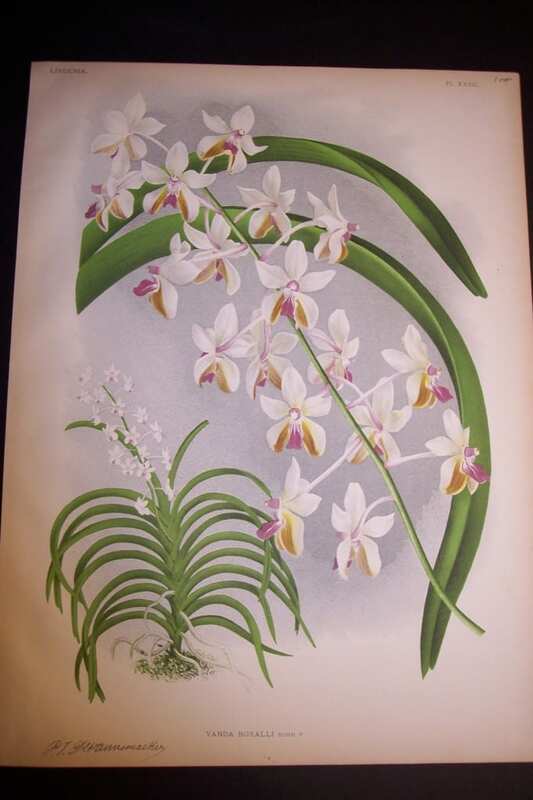 Lindenia Orchid Lithograph 708 $135. 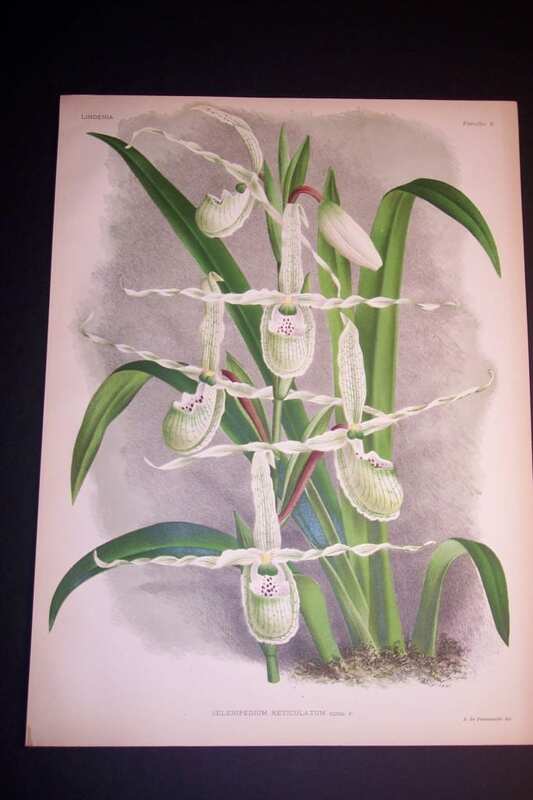 Illustration Horticole Catasetum 709 $135. 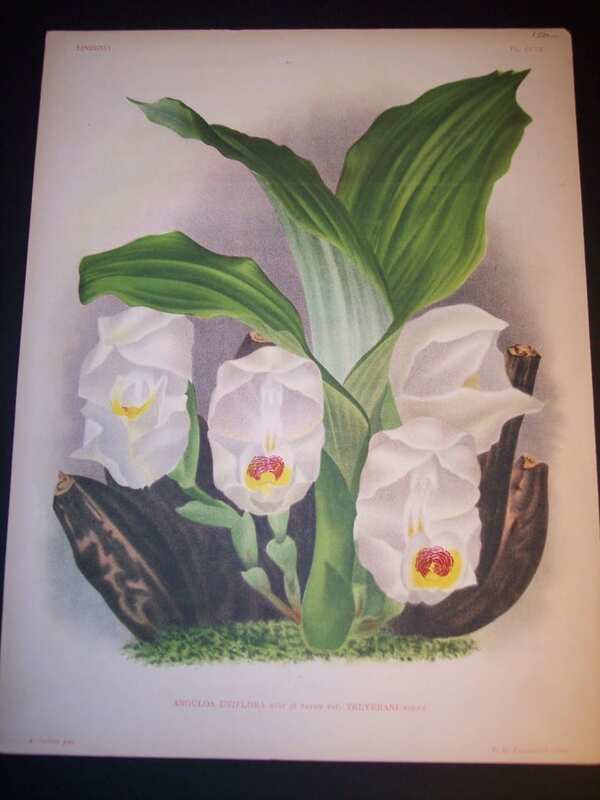 Lindenia Cattleya Aurea Orchid Lithograph 706 $150. 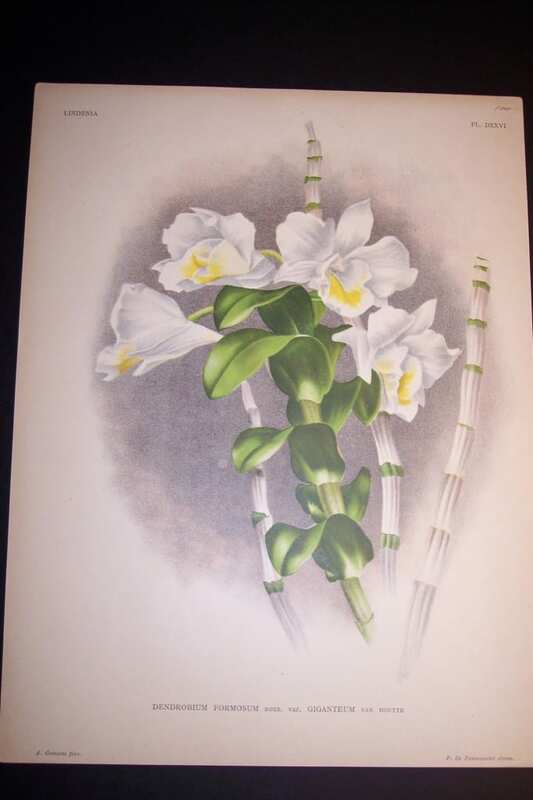 Lindenia Orchid Lithograph 705 $95. 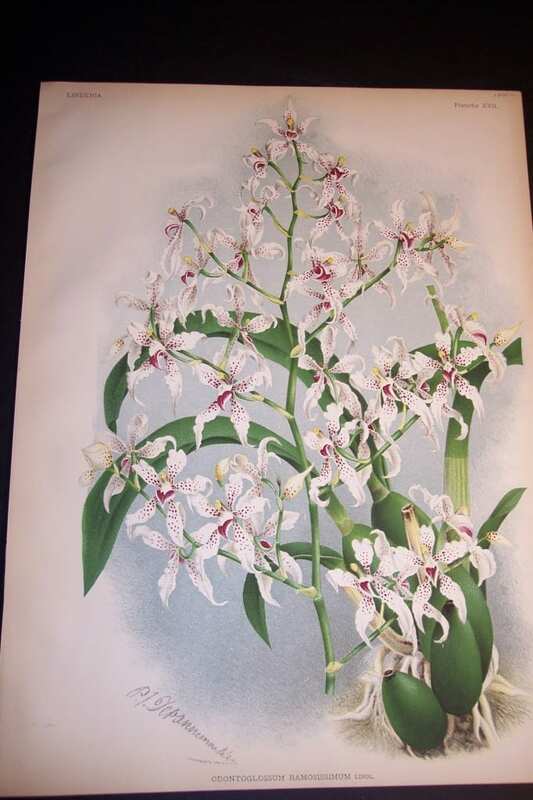 Illustration Orchid Lithograph 707 Odontoglossum $125. 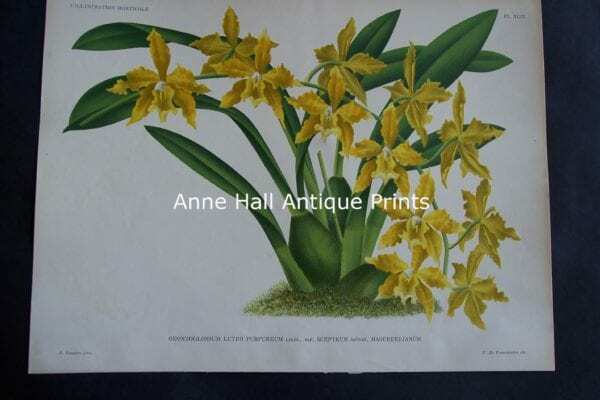 Lindenia Orchids, Orchis Antique Chromolithographs, Hand Finished. 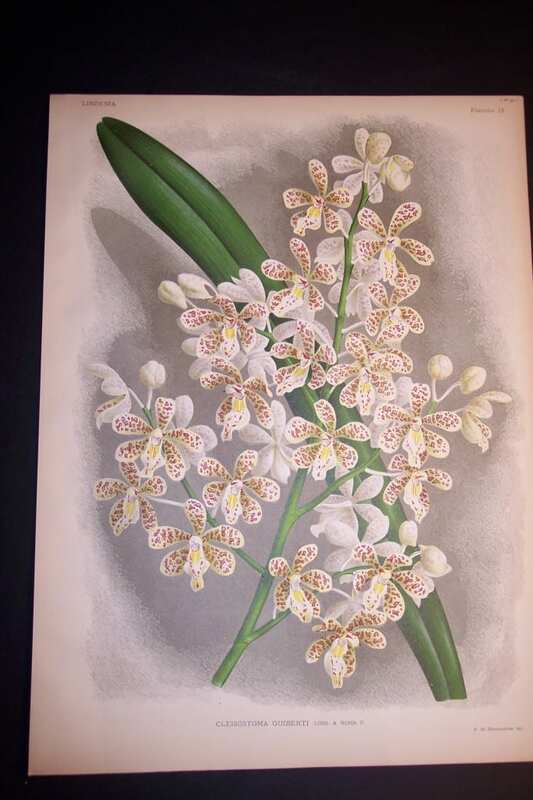 Lindenia Orchid Prints. VERTICALS. 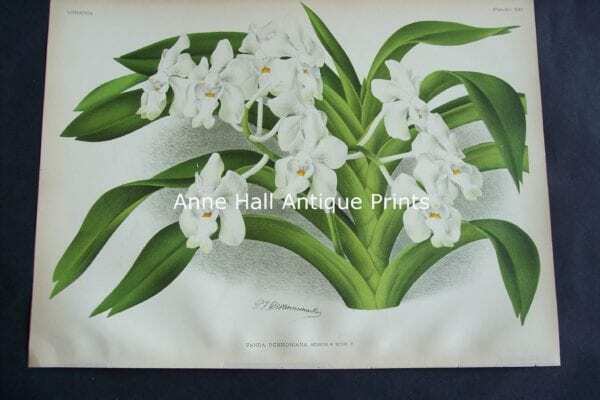 Published in Belgium c.1885 of varieties of orchids. Coming from Iconographie des Orchidees These are hand finished color lithographs that are bold and clean. Each color seen was applied with key stoned limestone plates called lithographs. This was a very laborious antique printing method. Then finished generally with water coloring or gum Arabic, etc. accentuations by hand. Each old print measures about 10 1/2 wide x 13 1/2 high. 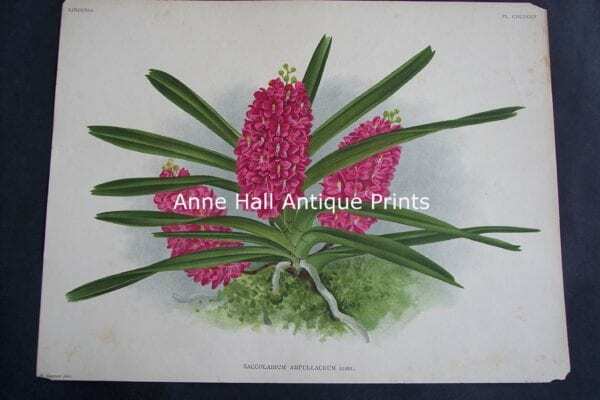 Lindenia Orchid Print 431 $75. 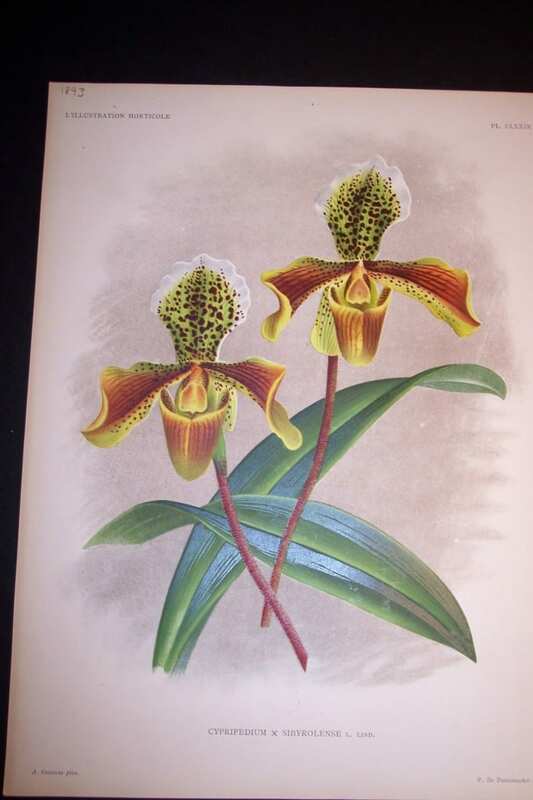 Illustration Lady Slipper Orchid 432 $150. Lindenia Orchid Print 433 $75. Lindenia Orchid Print 434 $75. Lindenia Orchid Print 435 $95. 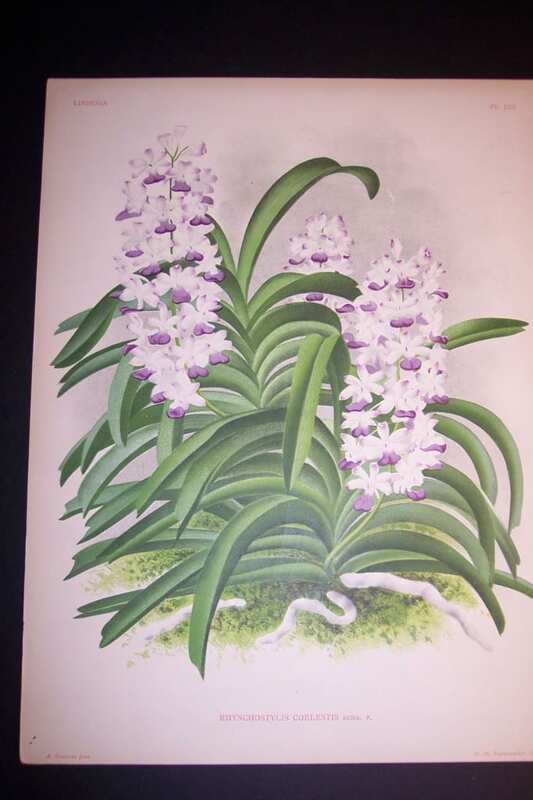 Lindenia Orchid Print 436 $75. Lindenia Orchid Print 437 $95. 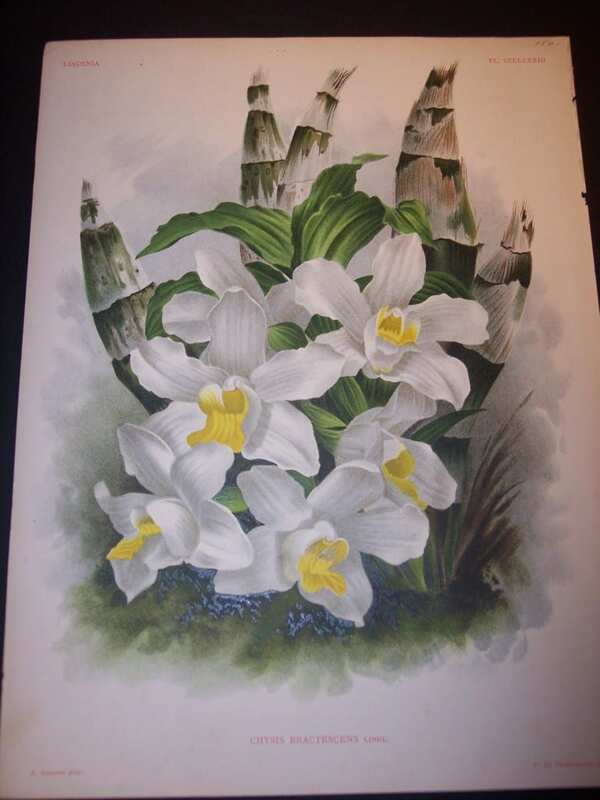 Lindenia Lady Slipper Orchid Print 438 $150. Lindenia Orchid Print 439 $85. 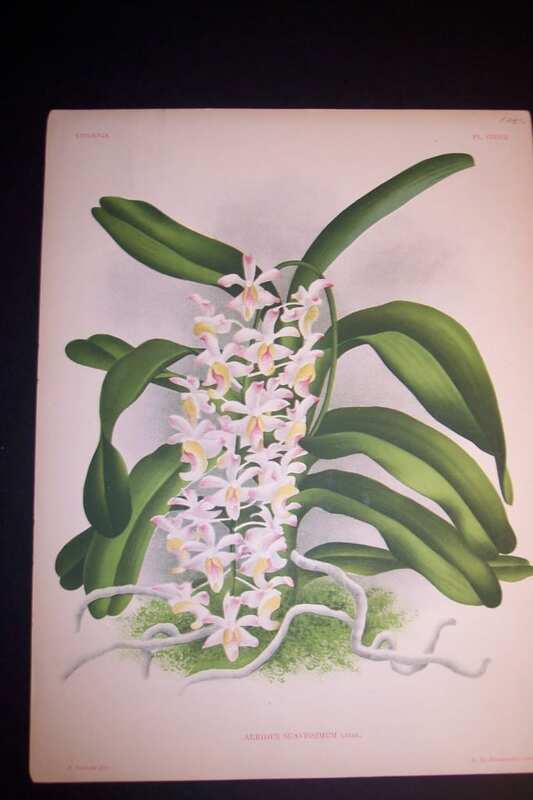 Lindenia Orchid Print 5724 $150. Lindenia Orchid Print 5723 $125. Lindenia Orchid Print 5722 $135. 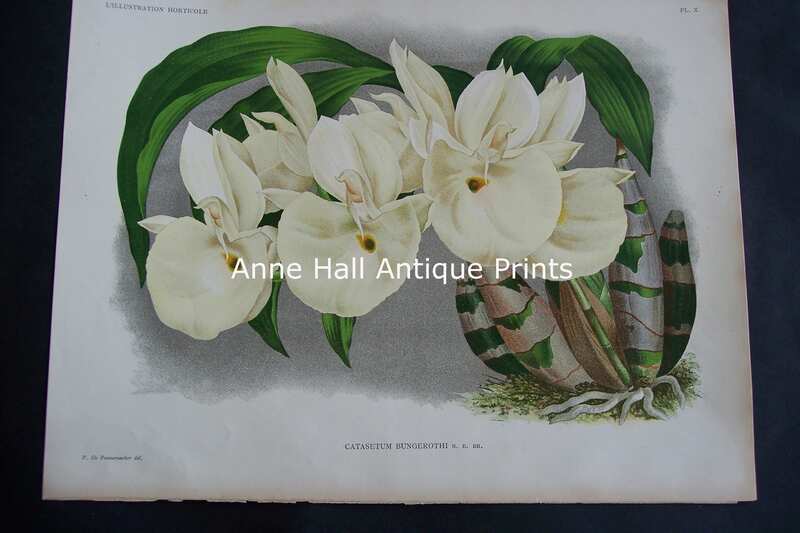 Anthurium Flower Prints: Antique Lithographs & Engravings! Palms: Antique Palm Tree Prints, Lithographs & Engravings. 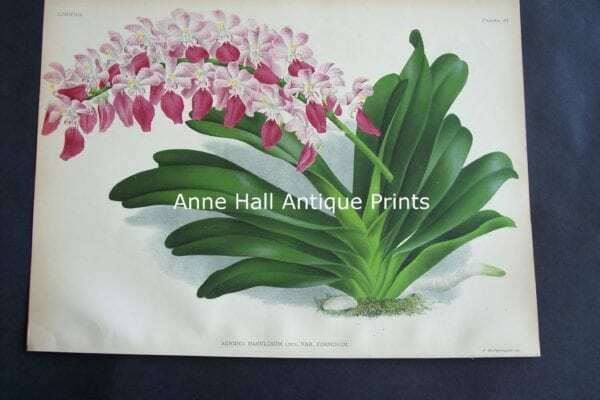 At Anne Hall Antique Prints, we are pleased to offer Lindenia Orchid Lithographs! 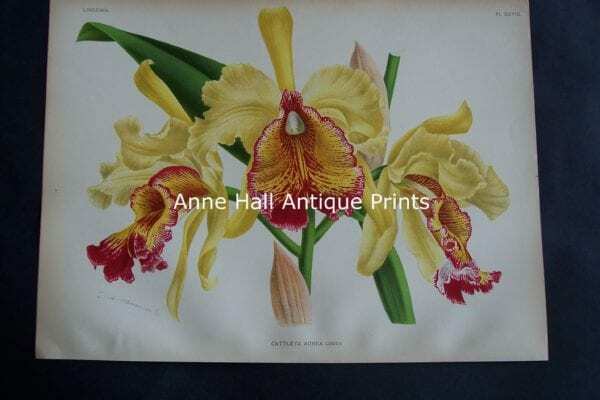 At Anne Hall Antique Prints we are pleased 珞 to offer Lindenia Orchid Prints, Antique Lithographs, by Jean Linden, published in Belgium c.1885 of all varieties of orchids. 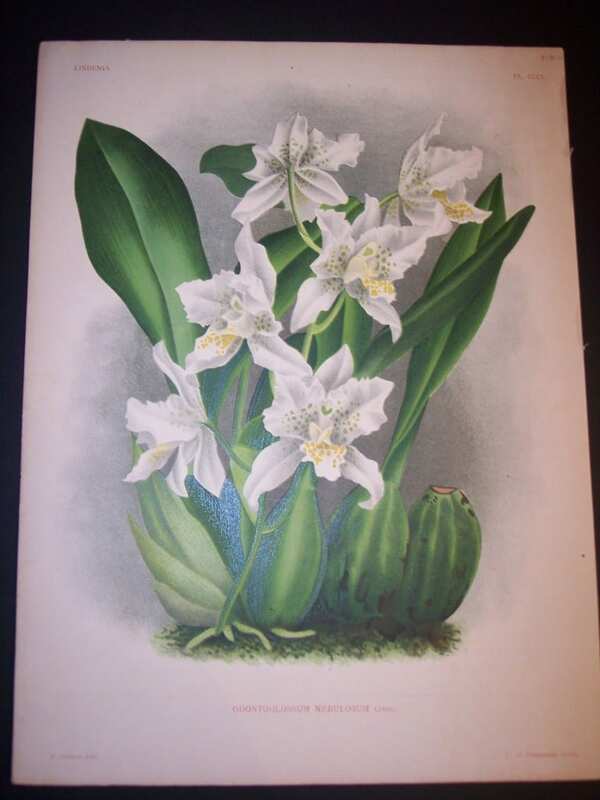 The thrill of discovering new species of Orchis was extremely popular during the 1800’s. Of course most of the people learning about the new species didn’t discover them themselves. Rather they discovered the botanical illustration published from the specimens themselves. Publishers would record all the important information. Subscribers were the recipients of the published data. The orchid hunters included Jean Linden, who traveled to South and Central America. Linden also sold plants in his Luxemburg nursery. Hunters gathered specimens. Brought them back to their country to cultivate. Specimens were shown off in museum curiosities in cities around the world. Many we held in private collections. Tropical Birds by Francois Nicolas Martinet. 18th Century Hand Colored Engravings.